Since 1975, the incidence of thyroid cancer in women has more thantripledfrom 6.5 to 21.4 per 100,000 women, mostly from papillary cancer. In other words, mortality from thyroid cancer did not increase, even though the incidence tripled. If this was real cancer, one would expect increase in mortality numbers. There was none. 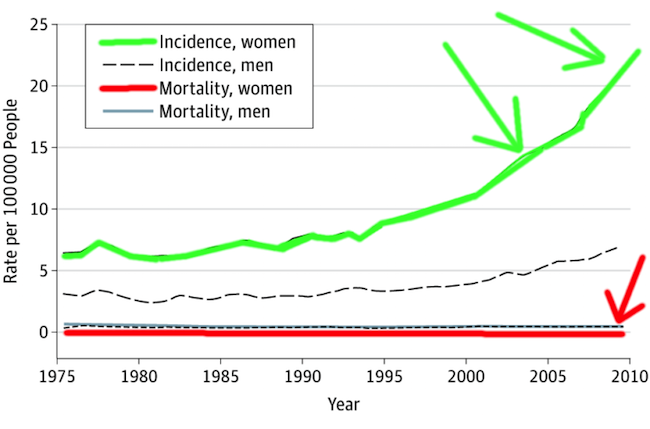 Above Chart shows thyroid cancer rising incidence females (GREEN Arrow), while thyroid cancer mortality is unchanged (flat line RED Arrow). Chart courtesy of Davies, Louise, and H. Gilbert Welch. (4) “Current thyroid cancer trends in the United States.” JAMA Otolaryngology–Head & Neck Surgery 140.4 (2014): 317-322. Dr Nikiforov writes in JAMA Oncology 2016 that many thyroid cancers are really not cancer and should be reclassified. (6) An example is theencapsulated follicular variant of papillary thyroid carcinoma.These cases are treated as having conventional thyroid cancer, yetthey are not really cancer, Dr Nikiforov says this type of pathology does not require radioactive iodine after surgery. 1) Advent of High Resolution Ultrasound imaging and thyroid screening programs which detect ever smaller “abnormalities”. 2) Commercial and professional vested interests. Hospitals make more money if they do more thyroid biopsies, thyroidectomies, and radioactive iodine treatments. Thyroidectomy creates a patient on thyroid medicine for life. 3) Conflicted panels such as the American Thyroid Association, and the Endocrine Society write guidelines that expand disease definitions and encourage overdiagnosis. 4) Malpractice Litigation punishes underdiagnosis but not overdiagnosis. 5) Health system incentives encourage more testing and more treatment. 6) Cultural beliefs that more is better; faith in early detection unmodified by its risks. (12)Paraphrased from Ray Moynihan. “Preventing overdiagnosis how to stop harming the healthy.” Bmj (2012). Over-Diagnosis of “Hysteria” in Women. Our next example of medical iatrogenesis in women is Premarin, a horse estrogen isolated from the urine of pregnant horses. Available since FDA approval in 1942, Premarin has caused an estimated 15,000 cases of endometrial cancer, representing the largest epidemic of serious iatrogenic disease ever reported. (15) One might think this would be the end of any drug. However Premarin was promptly rehabilitated with the addition of another synthetic hormone, a progestin, to prevent endometrial cancer. Thus, in 1995, Prempro was born, a synthetic hormone pill containing both Premarin (the horse estrogen) and Provera (the progestin). Again, this was FDA approved, thought safe and handed out freely to millions of women. Our next example of medical iatrogenesis in women is Prempro , the combination of Premarin with Provera (medroxyprogersterone) found to cause breast cancer and heart disease. Four large scale studies showed increased breast cancer and heart disease from this estrogen-progestin combination pill. The Breast Cancer Detection Demonstration Project, published in 2000, showed an eight fold increase in breast cancer for estrogen-progestin users. (15) The Swedish Record Review, published in 1996, had a fourfold increase in breast cancer with progestin use. (15) The Million Woman study, published in Lancet in 2003, had a fourfold increase in breast cancer for estrogen-progestin combination users compared to estrogen alone users. (15) Finally in 2002, JAMA published the Women’s Health Initiative (WHI), an NIH funded study terminated early because of increased breast cancer and heart disease in the estrogen-progestin users. (15) Incredibly, the medical system is still dispensing this discredited drug to women. The next example medial iatrogeneiss in women is SSRI antidepressant drugs that were shown to have little benefit for patients with mild to moderate depression. The benefits of SSRI drugs areequivalent to placebo pills.(15). Adverse side effects include sexual dysfunction, movement disorders, increased suicidality, mania and violence and withdrawal effects. In spite of this, the discredited SSRI drugs are still being dispensed freely to millions of women. Radical Mastectomy:A disfiguring operation which provided no benefit compared to lesser procedures such as lumpectomy. Arthroscopy for Osteoarthritis:Was abandoned after studies found no benefit compared to conservative treatment. Screening mammograms:For under 50 age women offers more harm than benefit. Drs Welch, Udelsman, Nikiforov and Moynihan have come forward to alert the public to the“Epidemic of Overdiagnosis of Thyroid Cancer”, a form of medical iatrogenesis in young women. Since Alum Jax Cole’s pathology report was not made public, we don’t know if her particular case was overdiagnosis. Based on the epidemiology data alone, many young women with thyroid cancer are overdiagnosed. How many? For every 43 women diagnosed with thyroid cancer, one (2.3%) will die from metastatic thyroid cancer, and the other 42 (97.7%) will eventually die from other causes. About 1,070 women die from thyroid cancer annually. This number has not changed over 30 years in spite of aggressive detection and treatment. For comparison, about 41,000 women die from breast cancer annually. “the observed increasing incidence (of thyroid cancer) is not mirrored by prevalence within autopsy studies and, therefore, isunlikely to reflect a true population-level increase in tumorigenesis. This strongly suggests that thecurrent increasing incidence of iDTC most likely reflects diagnostic detection increasing over time.” (23)byL. Furuya-Kanamori,Prevalence of Differentiated Thyroid Cancer in Autopsy Studies Over Six Decades: A Meta-Analysis.Journal of Clinical Oncology, 2016. 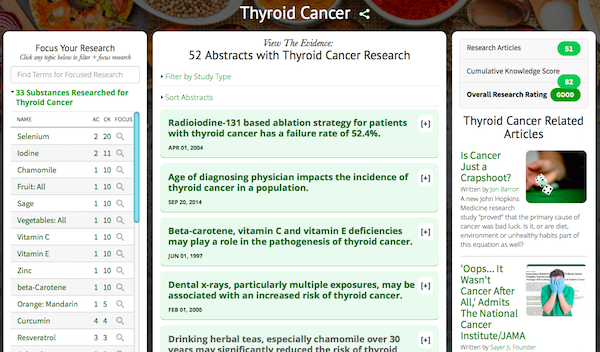 For evidence-based, natural health information on Thyroid Cancer, visit the GreenMedInfo.com Research Dashboard. For references, please see original publication.